Legendary game programmer and Doom co-creator John Carmack is getting a new "full-time" job. He's going to be working as the head of technology at Oculus VR, the company behind the upstart Rift virtual reality goggles. Possibly, though the situation is a bit confusing. John Carmack joins Oculus VR full time as Chief Technology Officer and will work out of Oculus’ brand new Dallas office. Formerly at id Software, John is now full time at Oculus VR working on the Oculus Rift. We're trying to reconcile the two, as it's unclear just what Carmack's role at id will be going forward. When asked straight-up if Carmack was gone form id, a Bethesda rep replied, "No, he is not." UPDATE: Bethesda/id clarifies: "John will spend time working out of Oculus as part of his role with them, but he will also continue to work at id." The new Oculus gig is a good fit, as Carmack has been vocal about his interest and support of the Rift. 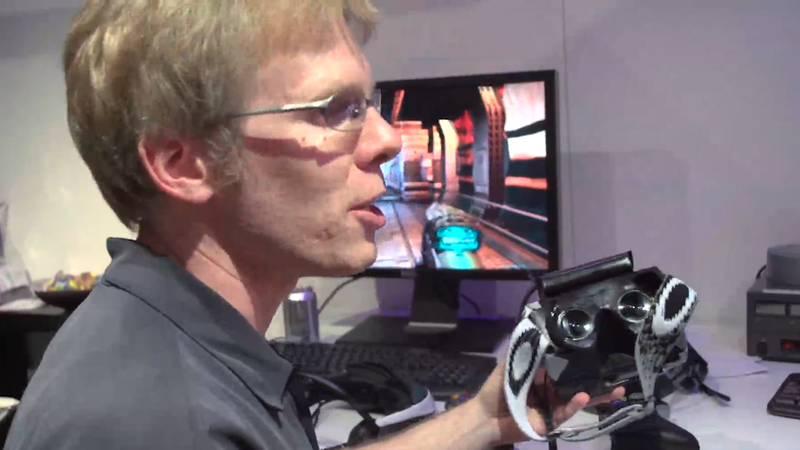 In fact, Carmack is the one who debuted the Rift to the press in one-on-one meetings at E3 2012.
id software was co-founded by John Carmack in 1991. Under Carmack's technical leadership, it developed numerous games in the Doom and Quake series. Its most recent major title was 2011's Rage. Carmack also is heavily involved in his own rocket company, Armadillo Aerospace. He delivered his annual keynote address at the id-centric fan convention QuakeCon last week.